I have not been a fan of chai tea, but this cider is delicious! Not something one would want to have with a meal, but with dessert or on it's own as it's a very specific flavour. Delightful stuff! More an autumn or winter flavour than some of the lighter ones I've had tonight. 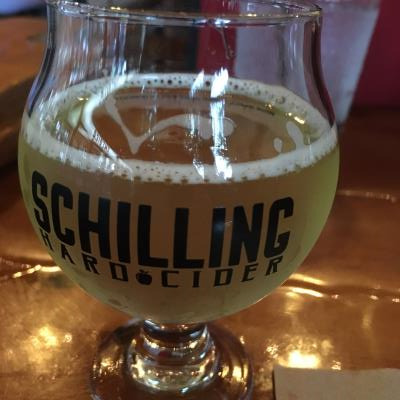 I must say, of all the cideries I've sampled several flavours of, I am liking the Schilling cider varieties more and more. Mmmmm. Chaaaiiii. I love chai tea. Thought I'd hate chai cider. I actually like it. Nice cinnimon and clove flavor. It would be great with Thanksgiving dinner.